Atheneum Books for Young Readers, 9781442423367, 304pp. Christopher Denise is an award winning children’s book illustrator and visual development artist. His books have appeared on the New York Times bestseller list and have been recognized by Bank Street College of Education, Parents’ Choice Foundation, and the Society of Illustrators Annual Exhibition. Christopher Denise lives with his family in Rhode Island. 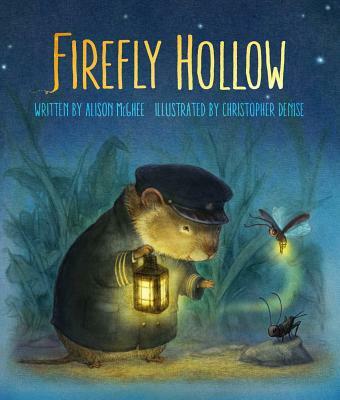 Firefly and Cricket, two tiny animals with big dreams, challenge the status quo by befriending a miniature giant (a boy named Peter)—and by pursuing their destinies with the help of an old river vole. Firefly wants to fly to outer space someday, and Cricket aspires to be "the cricket version of Yogi Berra." Although they both have been warned repeatedly by the cricket and firefly nations about the hazards of human beings, they are intrigued by Peter's way of life. After all, he and another miniature giant used to play catch, and others of Peter's tribe have reached the moon. Vole, the sole, determined survivor of his river people, has spent much of his riverbank life teaching himself to sail. As the story unfolds, readers of all ages will be captivated by a third-person voice, both soothing and gently humorous, that delves deeply and sensitively into such subjects as friendship, death, cultural conflict, dreams, and the adjustments that must be made on our lives' journeys. As with the beloved classic Charlotte's Web, bits of natural history are woven into a plot in which a human child's emotional growth is secondary to a whimsical tale of interspecies friendships. Illustrations reminiscent of The Wind in the Willows further enhance a wise and lovely reading adventure. This sweet and memorable tale deserves both a sequel and a film version. Firefly dreams of flying to the moon; Cricket of being a baseball catcher like Yogi Berra; and Vole of sailing to the sea. These three creatures of Firefly Hollow are brought together by their larger-than-life ambitions and a fascination with giants (humans) to tell a timeless story of friendship, perseverance, and growing up. Firefly is the daredevil of the firefly nation, constantly practicing aerial maneuvers and shocking her friends with bold ideas that knock them clean out of the air—maybe not all giants are bad. Has she learned nothing from Fear of Giants class? Cricket has similar giant-related sentiments, only his views have made him the laughing stock of the cricket nation. When Cricket and Firefly run away, they pursue their dreams in earnest with the help of a miniature giant and a solitary river vole. Like Kate DiCamillo’s The Tale of Despereaux (2003), this lights up darkness through camaraderie and knowledge. A quiet grief underpins much of the narrative, but it serves to strengthen the characters’ understanding of the world and their resolution to take it by storm. Denise’s gorgeous illustrations range from full-color plates that glow with warmth to delightful sketches. Each of the hollow’s nations is richly imagined, as are their respective ambassadors. Brimming with adventure, friendship, loss, and courage, this story will set your heart aglow. McGhee (the Bink and Gollie series) introduces three tiny creatures with big dreams in a whimsical tale that examines how friendships change and the value of chasing one’s dreams. Firefly longs to fly to the moon, while her friend Cricket wants to be “the cricket version of Yogi Berra” (“Why shouldn’t crickets learn how to catch falling objects?” Cricket reasons. “Wouldn’t that make them all safer?”). Their respective clans think both notions are ridiculous. The two find kindred spirits in Vole, the last of his river-dwelling kind, and Peter, a “miniature giant” who is mourning the departure of a close friend. As Firefly and Cricket pursue their goals and explore new terrain, they come to understand their limits and the risks of being different. The book’s portrayal of the world as an exciting but dangerous place filled with huge human “artifacts” (all warmly evoked in Denise’s illustrations) will tickle readers’ fancies, and the poignant conclusion may cause a few tears to be shed. The denizens of Firefly Hollow deal with loss, maturation, and friendship in this gentle novel. Firefly wants to fly to the moon. Cricket wants most to be the catcher in a baseball game like his hero, Yogi Berra. The miniature giant Peter (a human child) wants his best friend back. These three youngsters help one another to cope with various losses and fears. Watching over them is Vole, an elderly creature who has his own quest to follow. The pains of growing up are sensitively portrayed by McGhee as are themes of prejudice, death, overcoming fears, and the power of friendship. It is a lot to juggle but the author does it gracefully, effortlessly interweaving the characters’ stories. Young readers may not grasp some of the nuances, such as what happened to Peter’s best friend. However, readers will root for the appealing characters and enjoy their world. Denise’s illustrations are lovely, adding tremendously to the charm of the book. VERDICT Fans of Kate DiCamillo and E.B. White will enjoy this charming tale of unlikely inter-species friendships. A kindred spirit “understands the deepest dream of your heart,” Vole says to Firefly and Cricket. This trio of friends has big dreams: Vole dreams of sailing down the river to rejoin family and friends lost in a flood years before; Firefly dreams of flying to the moon; and baseball-loving Cricket yearns to be the best catcher since Yogi Berra. Vole has no community, and Firefly and Cricket feel like outsiders in theirs. The affectionate third-person narration follows each friend’s preparations for his or her quest, and when the time comes, Firefly does indeed shoot for the stars, Cricket makes the big catch, and Vole realizes he has not lost everything after all. McGhee has so ably created a believable world where dreams can come true that the entwined fates of a firefly, a cricket, and a vole (and their “miniature giant” friend Peter, a human boy) will move readers with its rightness. Where once they had sung “Take Me Out to the Ballgame” with abandon, Firefly now says, upon returning from her aerial adventure, “It’s not true, you know…That part in the song that says you don’t care if you never get back…I cared.” Fifteen full-color plates (only three seen) will embellish the finished edition.